Drill hole AGN-19-012 with 34.4 g/t Au over 0.5 metres confirms the original drill results from the1950s at the Northgate Zone. 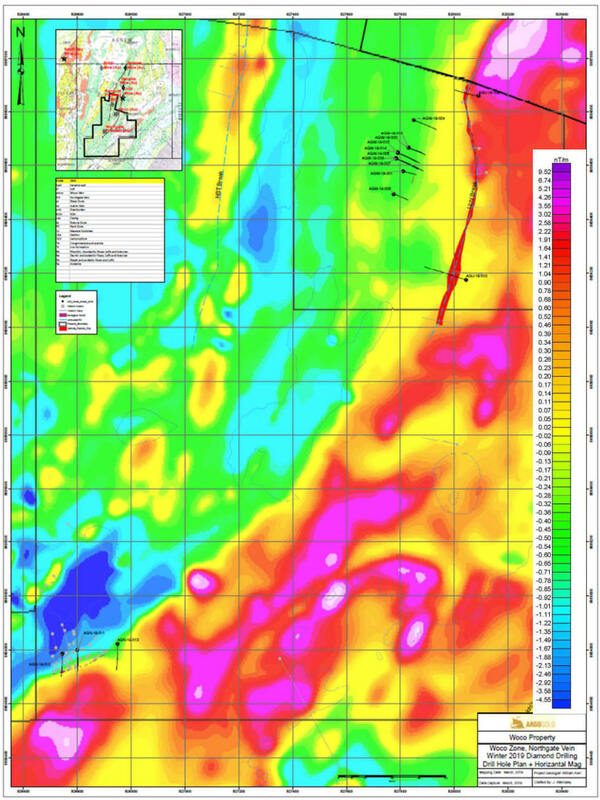 Drill hole AGW-19-007 with 7.4 g/t Au over 0.5 metres confirms mineralization at a depth of 223 metres in the Woco Vein. Drill hole AGN-19-011 with 6.8 g/t Au over 1.5 metres confirms the original drill results from the1950s at the Northgate Zone. Drill hole AGN-19-013 with 3.06 g/t Au over 1.5 metres extends the known strike length of the Northgate Zone by 50 metres. Bill Kerr, Lead Exploration Geologist, commented: "This initial drill program targeted three gold zones on the property. The Woco Zone has been shown to be a brittle fracture zone with very high-grade gold and good continuity to the 200-metre level. In addition, the grade and width has been demonstrated to increase with depth from surface. At the Northgate Zone, Argo Gold both intersected the gold bearing structure in two holes and while testing the Uchi-Break to the east with hole AGN-19-013, extended the known strike length of the Northgate vein by 50 metres." Two step-out exploratory drill holes successfully targeted the Uchi Break. 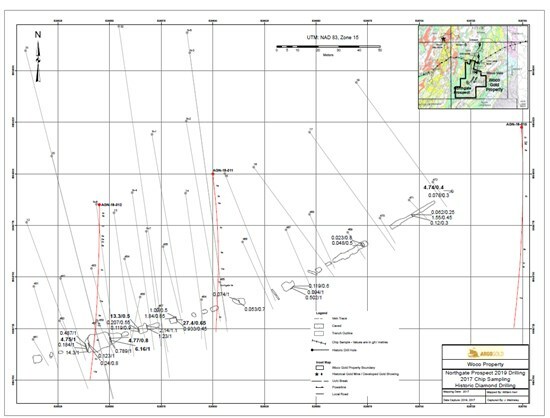 AGU-19-009 intersected a 5.1 metre zone of massive sulphides (pyrrhotite and pyrite), believed to be associated with a 400 metre long Airborne Electromagnetic (AEM) conductor wholly on Argo Gold ground. Gold assays for the massive sulphide have been received and are anomalous but not economically significant. No other base metals sulphides were apparent in hand specimen, base metals analyses are still outstanding for this zone and any sulphide intersection on this property must be further investigated due to nearness to the South Bay Cu-Zn mine. A second hole AGU-19-010 testing the Uchi Break in a magnetically disturbed zone 700 metres to the south, intersected a 2.34 metres ductile shear zone interpreted to be the Uchi-Break which returned weakly anomalous gold in one half-metre sample. See Figure 1. The final hole AGW-19-015 attempted to intersect the Woco vein at the 225-metre level and is believed to have stopped just short at 249 metres. It is believed that this hole steepened, and the mineralized zone was not tested. The Woco vein remains open down plunge and a deepening of this cased hole remains a priority. Please review more detail in Figures 2, and 3. Further work is warranted on this project. On the Woco vein, a deepening of Hole AGW-19-015 is a high priority to attempt to extend continuity and thickness at the 225-metre level. In addition a surface geochemistry survey is required to locate the strike extensions. Now that the location of the Uchi Break has been better defined near Argo Gold's north claim boundary, further ground surveys will be planned to define drill targets along this favourable horizon and extend it over three kilometres to the south, where it intersects the Northgate Zone. Exploration work will be focused on linking the east end of the Northgate vein to the through-going Uchi-Break. Previous work by Woco Gold Mines in the 1930's on the Northgate Zone disclosed an average of 15.53 g/t Au over a width of 0.9m for a strike length of 61m; only a portion of this zone was tested by the recent drilling (Source: Ontario Assessment Files). Stripping and trenching is also recommended to be done at the Northgate Zone to obtain a better understanding of the geology on surface for use in the identification of future drill targets. In addition, the Raingold Showing (also known as the Geisler Patents), which was acquired by Argo Gold in February 2018 is recommended to be sampled. Historical work has disclosed trenched values of 6 g/t Au over a 2.3m width over a length of 275m with a higher grade core of 122m averaging 8.1 g/t Au over a 2.1m width (Thompson, 1938, ODM Report ARV47). QA/QC Samples were split with a diamond saw, tagged and placed in securely sealed bags in the field, and transported by Argo Gold personnel to Dryden to Activation Laboratories Ltd. (ActLabs) which is ISO 17025 accredited. The diamond saw, after the last sample of every visible gold, was cleaned by scrubbing and then run through a brick for ten seconds. In addition, a blank sample was inserted into the sample stream after every instance of visible gold. A rigorous program of inserted duplicates, blanks and standards was instituted. The laboratory batch size was 35 samples, so Argo Gold ensured that blanks, duplicates and inserted OREAS control standards (three separate standards representing low, medium and high-grade values) were inserted every twenty samples. These results have been scrutinized and values were well within high tolerances. Every sample was analyzed for Fire Assay Gold with a gravimetric finish. Where visible gold was observed, these samples were flagged and were processed instead by pulp/metallics with a Fire Assay and then the pulp was shipped off for INAA. At ActLabs, the samples were sorted and dried in a 60C oven. Each sample was then crushed up to 90% passing 10 mesh, riffle split, and a 250g sample was pulverized to 95% passing 150 mesh. The pulverized samples were analyzed for gold using a Fire Assay with a gravimetric finish, other than visible gold samples as noted previously, ActLabs also has their internal system of inserted blanks, duplicated and inserted control standards which they used to ensure quality of the results. A total of 15 holes on the updated Argo Gold Property map displaying the Woco Zone, Northgate, and Uchi Break 2019 drill holes, on a Residual Magnetic Field background in Figure 1. 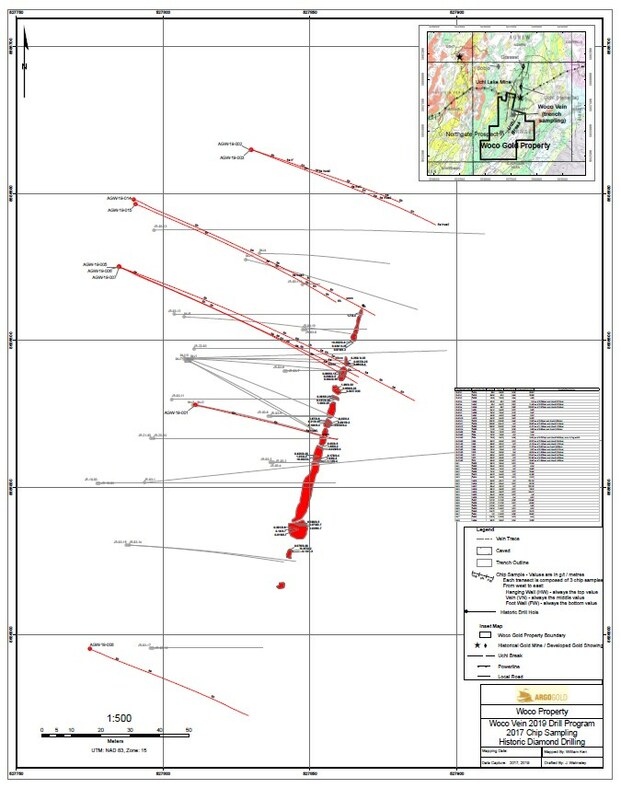 The Woco Prospect plan map displaying historical diamond drill holes (grey), 2019 diamond drill holes (red), and 2017 chip sampling is shown in Figure 2. The Northgate Zone plan map displaying historical drill holes (grey), 2019 drill holes (red), and chip sampling is shown in Figure 3.